2015 I WRAPS I 95 15) Pull vinyl back and place fingers on each side of cut. 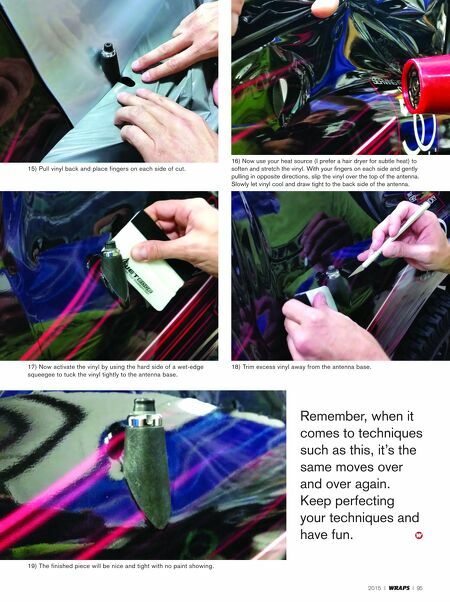 17) Now activate the vinyl by using the hard side of a wet-edge squeegee to tuck the vinyl tightly to the antenna base. 18) Trim excess vinyl away from the antenna base. 19) The finished piece will be nice and tight with no paint showing. 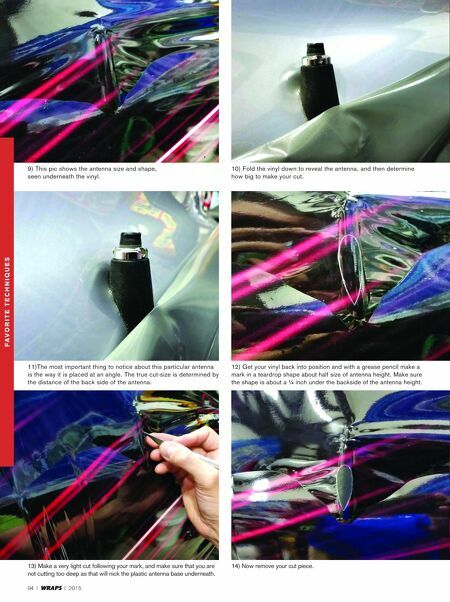 16) Now use your heat source (I prefer a hair dryer for subtle heat) to soften and stretch the vinyl. With your fingers on each side and gently pulling in opposite directions, slip the vinyl over the top of the antenna. Slowly let vinyl cool and draw tight to the back side of the antenna. Remember, when it comes to techniques such as this, it's the same moves over and over again. Keep perfecting your techniques and have fun.